Mario Land at night during the credits. Mario Land is a collection of boards featured in Mario Party 2. 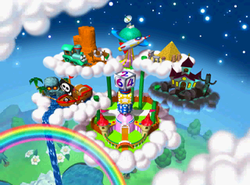 The land is split up into different game boards: Horror Land, Western Land, Mini-game Land, Pirate Land, Space Land, and Mystery Land. Additionally, later in the game, Bowser and a Koopa Kid kidnaps Toad and takes over part of Mario Land, calling it Bowser Land. The name came about when Mario and his friends were fighting over what the land should be called. Toad convinces them to name the land after whoever defeated Bowser. Depending on who became the superstar, the land can also be called Luigi Land, Wario Land, Peach Land, Yoshi Land, or Donkey Kong Land. However, regardless of the character the land always ends up being named Mario Land in the end. In the background of Mario Land, there is a giant Dice Block that shows the numbers 2, 4 and 6. This page was last edited on January 30, 2019, at 20:02.